This Independence Day, people flocked to fireworks shows galore across the U.S. For Roadway Construction Service (RCS), however, the 4th of July actually began many weeks prior to the holiday. 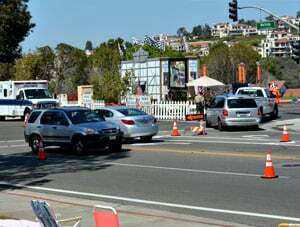 That’s because RCS provided special events traffic control for the dazzling Independence Day celebration at Lake Mission Viejo. And that means there were weeks of intensive planning long before the first skyrocket ever launched. What’s involved in the planning process? Just about everything under the summer sun. In fact, the operation is nothing short of a balancing act. Special events traffic control requires the large-scale orchestration of hundreds of variables. One piece out of place could lead to a major disruption of the event. Not exactly a great way to remember the day. How does Roadway Construction Service synchronize the intricacies of special events traffic control for events such as these? The process actually involves four critical phases. Planning. RCS begins the process with a thorough site survey. Based on the findings, their experts devise an in-depth traffic control plan. This blueprint takes into account factors and needs such as location assessment, safety walks, lane closures, traffic control, crowd control, barricades and K-rails. Once completed, the plan is submitted to the City Engineer for approval. Coordination with Event Staff. After the plan gains formal approval, Roadway Construction Service lays the groundwork to implement their strategy. This definitely is an example of large-scale teamwork. The RCS team meets with everyone involved, including event staff, city officials, and security services. Among the topics discussed during these intensive strategy sessions are ‘enter and exit points’, information distribution, and maintaining control of the event. Weeks of idea-sharing will be needed to bring everything into alignment. Advanced Notification. A bustling community such as Mission Viejo is well-traveled, to say the least. Surprises are the last thing motorists need, especially when the streets are buzzing with July 4th traffic. To ensure maximum safety, RCS alerts the community of lane and road closures well in advance. Public message boards are among the channels utilized to keep residents aware and prepared as early as possible. Safety Service. This crucial component addresses the safety of pedestrians, spectators, and motorists. Special attention is given to preventing congestion and gridlock so that traffic flows smoothly. Special events traffic control for this July 4th spectacular is only one example of the RCS commitment to excellence. Contact Roadway Construction Services to learn more about why they set the gold standard for the traffic control service, planning, and permitting industry.